Japanese animation classic My Neighbour Totoro is finally being screened in Chinese cinemas, 30 years after it was first released. The film, by Studio Ghibli and famed director Hayao Miyazaki, follows the story of two sisters who encounter Totoro and other forest creatures. Despite the movie's cult following, it has never been publicly shown in China. But many Chinese viewers have already caught it on DVDs or pirated downloads while growing up. The movie is the first Studio Ghibli movie to ever be released in China, which has a strict quota on the number of foreign films. "For China, film will always take a back seat to politics," Stanley Rosen, director at the East Asian Studies Center at the University of Southern California told the BBC, explaining that whether a Japanese film makes it to China often depended on the state of the political relationship. "Right now that relationship has improved significantly and there is a lot of movement on Sino-Japanese co-productions, including in anime." There are lingering feelings of resentment towards Japan in China relating back to their wartime history. Japan occupied China starting in 1931 and millions of Chinese people were killed by the time the war ended in 1945. Mr Rosen says Totoro director Hayao Miyazaki has been publicly critical of Japan's wartime aggressions and that has been viewed favourably in Chinese media. Nostalgic fans in China took to social media to praise the film's long-awaited release. "I can't wait," gushed a fan on the popular Sina Weibo micro-blogging site. "I used to watch it on DVD and I'm starting to feel nostalgic." Other Weibo users shared their feelings upon seeing the Chinese release poster. "I was flooded by a wave of emotions and suddenly felt like a child again," one user said. Another said she was going to take her daughter to watch the film in cinema. Charles Solomon, a lecturer at UCLA's School of Theatre, Film and Television, told the BBC that Ghibli films were already popular in China "for the same reason they're popular across the world". "Their characters have depth and complexity. They are individuals you feel you know and understand and people respond to that," he said. The critically acclaimed animation is one of Japan's most beloved children's films. While some viewers draw parallels with Alice in Wonderland, the 1988 film was said to have been inspired by director Hayao Miyazaki's own experiences growing up. 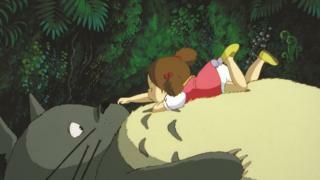 In the film, sisters Satsuki and Mei visit their ailing mother in hospital, echoing a young Mr Miyazaki who watched his mother recover from a severe case of spinal tuberculosis. My Neighbour Totoro is also often celebrated for its "innocence" - there are no villains or fight scenes - and its hand-drawn scenes of idyllic country fields, placing a strong emphasis on cultivating an appreciation for nature. Helmed by the legendary animator Hayao Miyazaki, Studio Ghibli has often been called Japan's answer to Walt Disney. But in many ways, the Japanese production house has proven to be completely original with its titles featuring anti-war and pro-environmental messages as well as strong female leads. Spirited Away became their highest grossing movie of all time in 2001. It also made history by becoming the first (and so far only) hand-drawn and non-English language animated film to win an Academy Award. In addition to an existing Ghibli museum in Tokyo, there are plans to build a special Totoro theme park in 2020.